This post is for everyone who thinks I always have a clean house. This is proof that I don't. 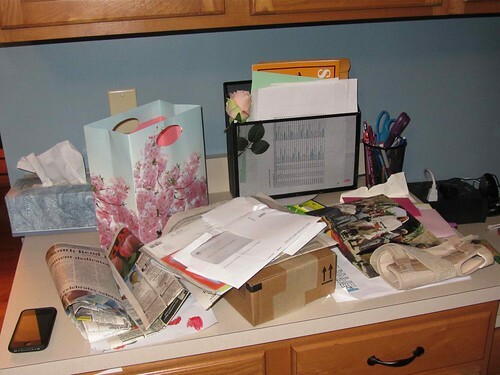 Does everyone have a place where clutter collects? At the old house the counter was only about 18" wide. At the new house it has doubled. Which means we have way more clutter. It's not always like this. Sometimes it's.....worse. It does get to Mickey and I so it only lasts for a few days before getting cleaned up. We can't seem to find a good solution to totally avoid this what with all the paperwork coming home from school, the mail and paper waiting to be read, and all the other non-important things that don't have a place to go landing there. That is not clutter! That is your mail that you brought in and set on the counter. Maybe you moved a few things to make it look a little messy. Sorry Kelly, you still didn't convince me!